Andreas’ grew up in a country where oil is the biggest industry. Here’s why he wants to change that. 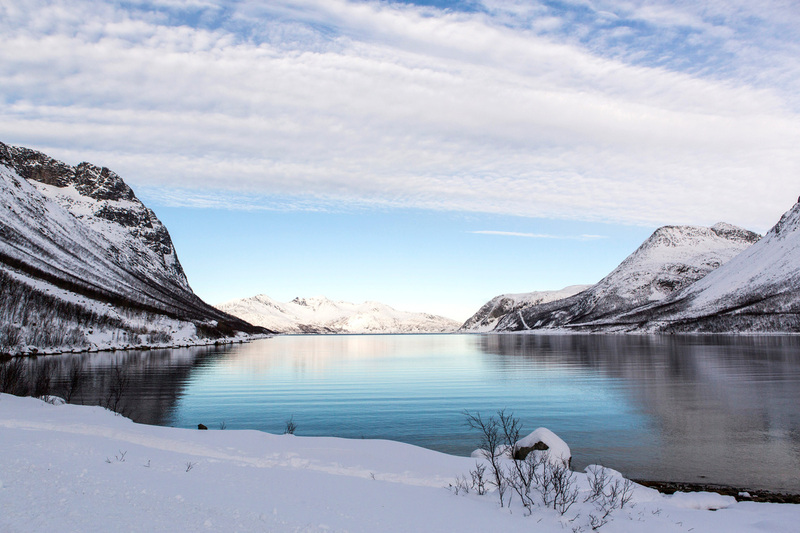 To many people around the world, Norway’s impact on the environment is invisible. The country is known for electric cars and clean energy, but beneath the surface is a sinister reality – it’s one of the world’s largest suppliers of oil and gas. This is where Andreas Randøy grew up. The young activist didn’t like the future he saw unfolding for his generation, so he took action. At 16, before he was even old enough to vote, he started working with Nature and Youth and then Greenpeace Norway to help curb oil extraction in the Arctic. Now, Andreas is risking his grades to help stage a mass school walkout. He’s joined an ambitious climate lawsuit against his government, and he’s not giving up until the country he calls home is held accountable for their impact on the rest of the world. Do you remember when you first realised the impact that humans have on the environment? We learn a lot in school about environmental problems, but I didn’t know how serious it was or how to do anything about it. I was 16 when I started to look into climate change and thought that I had to do something. For a long time Norway managed to make the rest of the world think that we’re a climate-friendly country because of electric cars and clean energy. But we export so much oil. We’re the 7th largest exporter of CO2, and that’s emissions that we don’t see in Norway. They’re used in other countries, but they’re still Norwegian oil. Because these emissions are so large – if we can stop it then we have made a real impact. How have the local impacts of climate change altered the conversation in Norway? This summer we started to feel the impact of climate change in Norway. It’s been a disaster for farmers. They don’t have enough food to feed their animals, and some of them even supported the climate lawsuits. The politicians and people in power talk a lot about climate change but when they make decisions, it’s still not as important as making money. But we’re heading in the right direction. With the climate lawsuit we gathered people who weren’t already in the movement. We had doctors and teachers who think that environmental problems are urgent and decided to help. It was inspiring seeing regular people do that – after all it’s regular people who go out and vote. As a student, what can you do to take action? What have you done in the past? 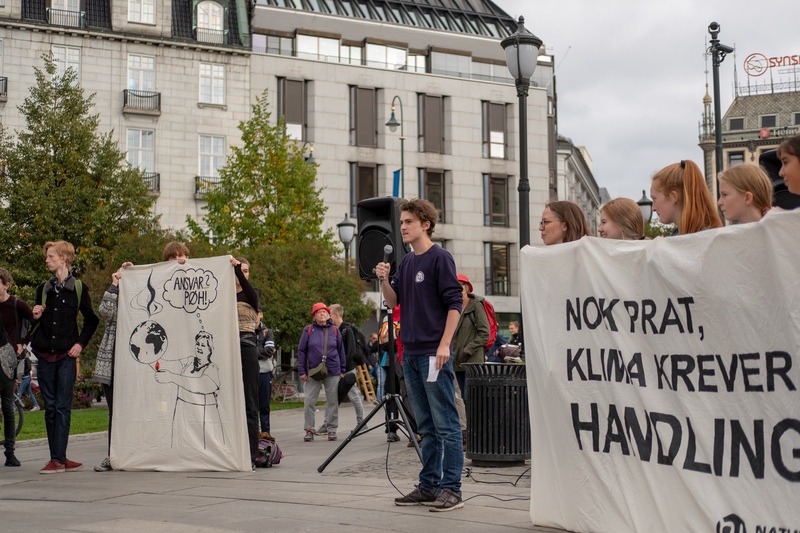 We were inspired by Greta Thunberg, a Swedish girl who sat outside the Swedish parliament for a month with a sign saying “I am striking for the climate” instead of going to school. We decided to do the same in Norway in solidarity. We managed to make almost 1,000 people walk out of school on a Friday and demonstrate outside their local city hall. A school strike was something that we’ve never done before but it might become a new means for us because more and more young people are dissatisfied with the climate policy. Most of our members are under the age of 18 and feel it’s unfair that the ‘grown-ups’ are deciding whether or not they will have a good future while they can’t even vote. You need to be in school for at least 90 percent of classes in Norway. 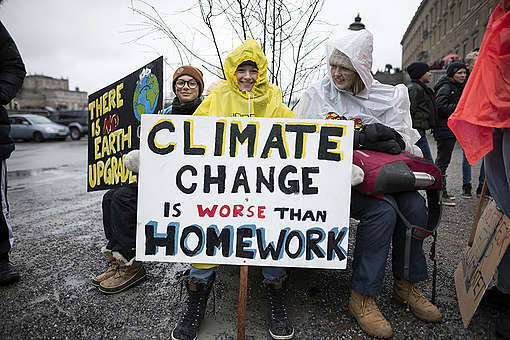 Some schools allowed the protest, but others were strict and said “no, this is not a legitimate action.” But participating in democracy and the climate debate is more important than getting good grades. I would rather have a world without environmental problems than good grades. Protest is obviously a great way to have some influence on things outside of your control, but is this the limit of what young people can accomplish? 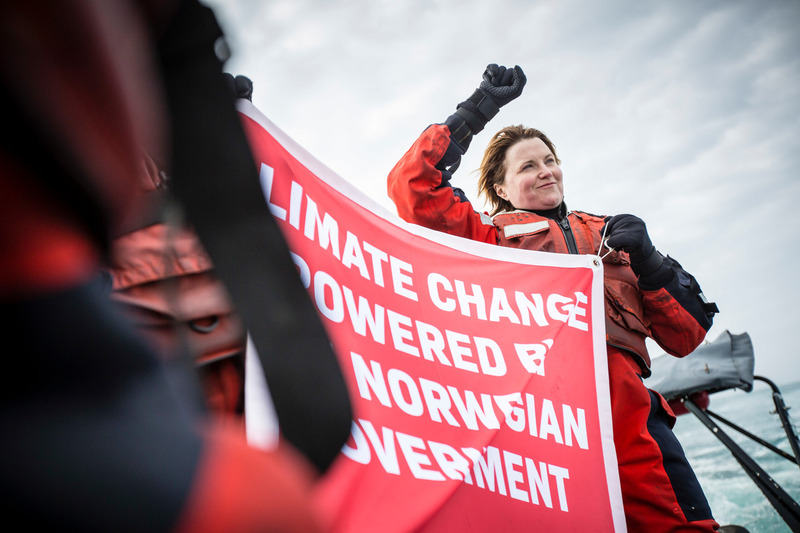 When the Norwegian government decided to open up a new oil field in the Arctic, Nature and Youth and Greenpeace Nordic sued the state because it violates our constitutional right to a safe and healthy environment. 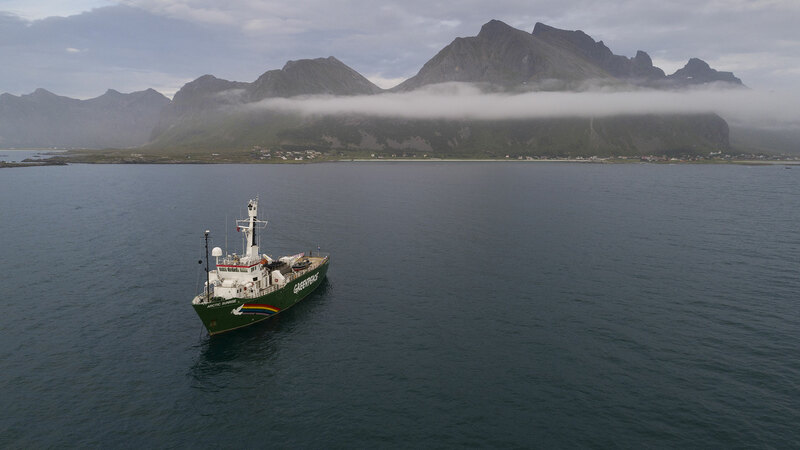 We know that we’ve already found more oil and gas than we can ever use, and now Norway wants to look for even more in the Arctic, which is a vulnerable and important ecosystem. Unfortunately, we didn’t win in the first round in court because the judge didn’t think that the emissions from oil and gas extracted in Norway and burned abroad were our responsibility. We have appealed and there will be a second round of court hearings next year. However, the judge did find, in a first for Norway, that everyone has right to a safe and healthy environment, as stated in our Constitution. We got a lot of attention, especially the two weeks we were in court. It was something that a lot of normal Norwegians talked about. More people saw the connection between Norway looking for new oil and climate change. Now the government talks about whether or not Norway has liability issues with contributing to climate change – whether they could be sued by a state in the Pacific that goes underwater. It’s worth doing even if we don’t win. Can you tell me about times when it has been challenging to work in this area? The oil industry is the biggest industry in Norway. It’s the biggest source of revenue for the state. It’s mostly an uphill battle and we’re used to losing almost everything. I do sometimes feel like I want to give up. But I get so angry with all these bad decisions that I actually get more motivated and want to do more. Some people argue that we need the fossil fuel industry to create jobs and pay for public services. What do you say to that argument? There are no jobs on a dead planet. If we don’t fix climate change first then creating good schools and hospitals don’t matter. We can’t be one of the richest countries in the world and keep on doing this. I also think it’s possible to get jobs in other sectors of society. Sweden is similar to Norway but they don’t extract oil and they don’t have a lack of jobs. In Norway all of the brightest people have been employed to find oil. Also, we know that the oil industry is damaging the fishing industry. If we manage it sustainably Norway could live off fish. 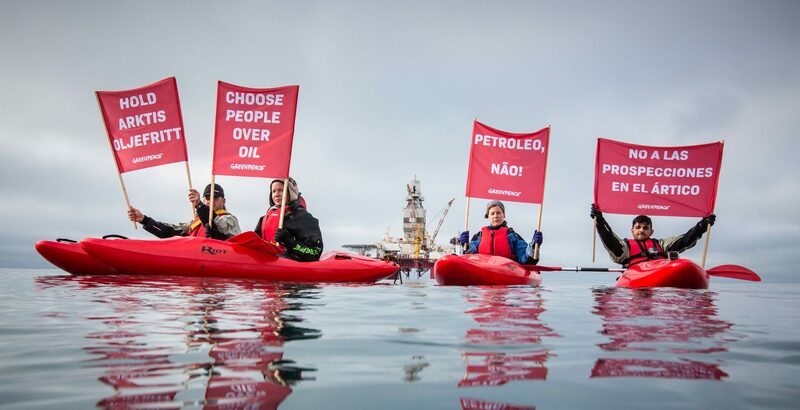 We’ve managed to keep the oil industry away from Lofoten Islands, because the local people stand strong against drilling. What do you imagine this space is going to look like five and ten years from now? There are a lot of things moving in the right direction but I don’t think it’s happening quickly enough. Norway is looking for oil that they will start to produce in ten years and will start using in fifteen years. At the same time there are a lot of positive things happening. If enough people see that this isn’t going to solve itself, that we need tell our leaders to prioritise climate change, then we can manage to solve the climate issue. But that hinges on people taking action now. I spend most of my time volunteering and I know that’s not something I can do as I grow older. But the environmental movement should be full of regular people. Whatever I end up doing with my time I will still be a part of the environmental movement. That’s somewhere I feel I belong. What do you think it is about young people that makes you so capable of creating change? Older generations can’t imagine a world that is without the oil and gas industry. But many young people can clearly envision this world. Now the oil and gas industry has trouble finding new people to work for them because the brightest young people want to go to school and learn about renewable energy instead. We see the world in a different way. Have you ever had the opportunity to talk to anybody impacted by climate change? From the Pacific Islands to the Philippines, what would you say to people already facing the reality of climate impacts? If climate change gets really bad then it’s not going to affect the rich and the powerful the most. It’s going to be regular people. That’s why regular people like us in all parts of society need to speak up and demand justice. To the people already impacted, I want to say that there are organisations who are working towards solving this. 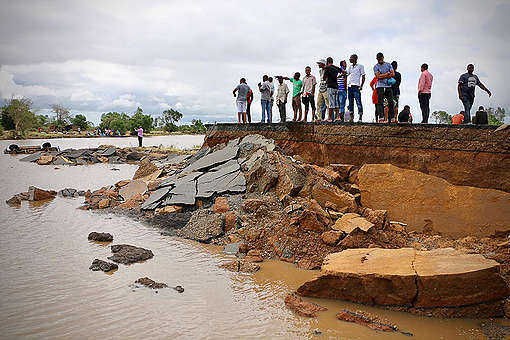 Developed countries aren’t doing enough but when we see and hear from island nations who risk being drowned, it can reach and affect politics in Norway. I hope that they stay strong. Do you have hope about progress we can make in the next couple of years and beyond? We have the technology today to use only renewable resources. Humans created this situation and humans can solve it. All big changes in society, whether it is women’s rights or other issues, seem really difficult before you make them. So it is always going to seem that way, but it’s entirely possible. People like Andreas are standing up and leading the change we need for a better future. There are many #ReasonsForHope on climate change! What are yours? Hi your article is eye catching. Thank god for Greenpeace and for the younger fighters as well.